(Nanowerk News) Researchers at Chalmers University of Technology have discovered that large area graphene is able to preserve electron spin over an extended period, and communicate it over greater distances than had previously been known. This has opened the door for the development of spintronics, with an aim to manufacturing faster and more energy-efficient memory and processors in computers. The findings will be published in the journal Nature Communications ("Long Distance Spin Communication in CVD Graphene"). "We believe that these results will attract a lot of attention in the research community and put graphene on the map for applications in spintronic components," says Saroj Dash, who leads the research group at Chalmers University of Technology. "In future spin-based components, it is expected that the electrons must be able to travel several tens of micrometers with their spins kept aligned. Metals, such as aluminium or copper, do not have the capacity to handle this. Graphene appears to be the only possible material at the moment," says Saroj Dash. "Our measurements show that the spin signal is preserved in graphene channels that are up to 16 micrometers long. The duration over which the spins stay aligned has been measured to be over a nanosecond," says Chalmers researcher Venkata Kamalakar who is the article's first author. "This is promising because it suggests that the spin parameters can be further improved as we develop the method of manufacturing. 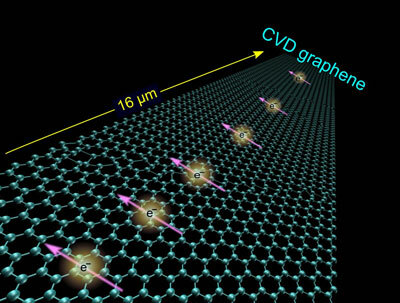 "Graphene is a good conductor and has no band gaps. But in spintronics there is no need for band gaps to switch between on and off, one and zero. This is controlled instead by the electron's up or down spin orientations," Saroj Dash explains. Spin is a quantum mechanical property of elementary particles, which among other things gives rise to the phenomenon of magnetism. The spin can be directed either up or down. For the electrons in a normal electric current, the spin is randomly distributed, and the stream carries no spin signal. But with the help of magnets, electrons that are fed into a conductor can be polarised, which means they all have their spin directed up or down. You could liken the electrons to a series of small compass needles, all pointing towards north or south. The challenge is to maintain this state long enough and over sufficiently long distances.